If you haven't already done so, please take a moment to fill my readership survey. I've gotten some great feedback already and am using this information to formulate ways to improve my blog, but more feedback is certainly welcome and desired. You can read more about my purpose for this survey in the original post. Also, each survey entrant is also entered for a chance to win a great prize! TAKE THE AMOM READERSHIP SURVEY NOW! 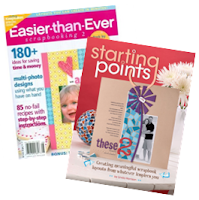 As a thank you for taking the time, one responder will win a free copy of Starting Points: Creating Meaningful Scrapbook Layouts From Whatever Inspires You by Linda Harrison and Easier-than-Ever Scrapbooking 2 from Creating Keepsakes. All you have to do is submit your survey by 5 p.m. on Thursday, December 23rd, 2010, include your email address at the end of the survey before you click submit and you'll be entered for your chance. Random.org will choose and I'll announce the random winner on Friday, December 24th, 2010. GOOD LUCK...and THANK YOU in advance for your input!